Have a look at our Quick Guides! Going abroad is essential to prepare yourself for a career in the new global economy. These 35 Quick Guides cover the most popular go abroad topics to help you develop your global career skills and prepare for international work (at home or abroad) in a global economy. LEGEND: = link to the original MyWorldAbroad article(s) used to create the Quick Guide. Get started with our Quick Overview Guide! The Four Parts to Acquiring Global Career Skills Are you ready for the challenge? Your International IQ Get ahead with a global mindset! Understanding Culture Shock Get ready for your adventure abroad! Women's Safety Abroad Be outgoing. Be bold. Go abroad! The North American Identity in the International Workplace Get to know your own culture! Re-entry Shock Succeed with cross-cultural essentials! 10 Easy Ways for First-year Students to Build International Skills International skills have huge value! 24 Ways to Help You Go International Expand your horizons! Career-boosting Strategies for International Students Studying in North America Maximize your time in North America! Travel Smarts Are you a street-wise traveler? Funding Hacks: Going Abroad No Matter Your Budget You CAN go abroad! Study Abroad for a Great Education Build skills, perspective & confidence! Career-boosting Strategies While Studying Abroad Think strategically while abroad! How to Survive Your First International Internship Make an impression abroad! Job Hunting During Your International Internship Set your sights on career success! How to Research an Organization Be the best you can be! The Go Abroad Application Process Get organized to get ahead! How to Be an Ethical International Volunteer Be the best you can be! Career Tips Before You Travel Abroad Rise to the challenge! Career Tips During Your Travels Abroad Do what it takes! Teaching English Overseas: A Stepping Stone to International Careers Jump-start your global career! Language Learning and International Careers Communicate across cultures! The Ideal International Profile Be an outstanding candidate! Career Tips After Your Time Abroad Turn your experience into success! LinkedIn: Creating A Standout Student Profile Stand out from the crowd! Social Media for Career Success Don’t just scroll – go for gold! Marketing Your International Experience to Employers Speak confidently about your skills! Selling Your International Skills With an Elevator Pitch Describe your professional self! An Overview of International Resumes Win the day with your resume! International Resumes Are Different Show recruiters your best self! Interviewing for an International Job Articulate your goals! International Careers, Love Affairs and the Trailing Spouse When you go abroad, your life goes with you! Spousal Employment and Freelancing Abroad Will you become a digital nomad? Our popular Quick Guides are packed with critical information about building international competency and succeeding abroad. Our 30+ Quick Guides cover the most popular go abroad topics to help you develop your global career skills and prepare for international work (at home or abroad) in a global economy. Share these Quick Guides with student friends interested in going abroad. Share the URL links with school friends and alumni via social media to introduce them to MyWorldAbroad. 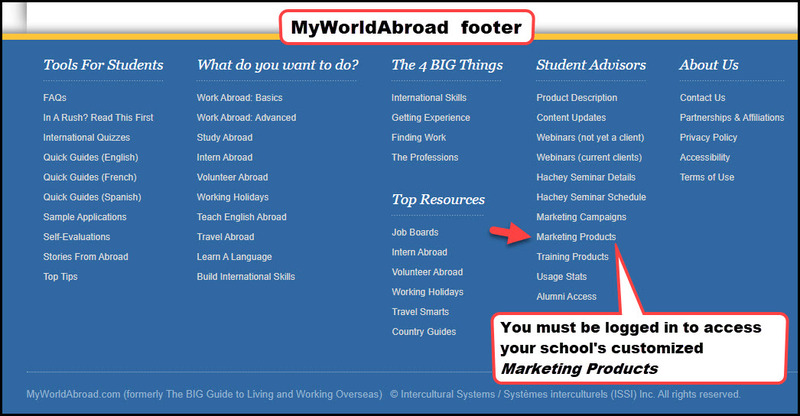 Distribute the MyWorldAbroad poster (customized for your school) when handing out Quick Guides so that students at your school know they have FREE access to our site. Share these Quick Guides with students on your school's website, a link on social media, an email blast, newsletters, pre-departure orientations, re-entry orientations and online workshop material. The more you link, the more students will click. The URL for each Quick Guide is not password protected, so you can provide direct access to students (i.e. students do not need to be logged into MWA to access our Quick Guides). Sample link wording: We have excellent student-friendly sample wording to go along with your Quick Guide links. Check this out. Make Quick Guides a regular feature in your newsletter or social media. Consider using this short sample wording to create a regular column to highlight individual Quick Guides in "each" edition of your newsletter, or to send out weekly in social media. Place direct links to our Quick Guides on various pages of your school’s Web site: Many Quick Guides address the specific issues students are concerned with: finding internships abroad, finding work abroad, studying abroad and building international skills, etc. So, why not share our guides with them directly online? Print & Distribute Quick Guides: Distribute them in public waiting areas, during international events or in international courses. Print out copies of your favorite Quick Guides and leave them for students to peruse in the lobbies of your Career Center, Study Abroad or International Student offices. The footer at the bottom of each Quick Guide lets students know how to register for free access to MWA. Hand out our Quick Guides during Career Center workshops, such as “How to Intern Abroad,” “How to Volunteer Abroad,” “How to Find an International Job.” Hand them out during study abroad workshops, such as “Pre-departure Orientation” or “Re-entry Orientation.” Hand them out during international events or distribute to members of international clubs on campus. Hand them out to classmates taking in international courses. Promote global career skills to first year students: Both the Career Center and the Study Abroad Office can take a broad approach to encouraging students to think internationally starting from the students' first day on campus. Consider distributing our Quick Guide below in the information packages of first-year students when they arrive for orientation. The Quick Guide can be printed and distributed, or it can be e-mail or sent out as a link. QUICK GUIDE: 10 Easy Ways For First-Year Students To Build International Skills. Spanish Quick Guides: Encourage first generation students to share our Spanish Quick Guides with their parents to highlight the career value of going abroad. Distribute your customized MyWorldAbroad school poster when handing out Quick Guides, so that students know that they have FREE access to MyWorldAbroad. Our Quick Guides provide the fundamental basics for helping students make the connection between the go abroad experience and their future work in a global economy. Encourage students to learn these principals and use them in parallel with your current go abroad advising materials. Use our Quick Guides during one-on-one advising or to promote discussion during workshops, including pre-departure and re-entry advising. About Reproduction Rights: Each Quick Guide must be reproduced in its entirety and may not be edited for inclusion in other documents without the written permission of our editor. Short excerpts may be used to substantiate a review or promote the site. Quick Guides are available above as pdf files (8½” x 11”). Most Quick Guides are a single page, a few are two pages and just a few are longer. Quick Guide content is drawn from the articles of the same names found throughout MyWorldAbroad.com.